You might have read our post a while back on Chickenpox: Being prepared – if not, you can read it here. 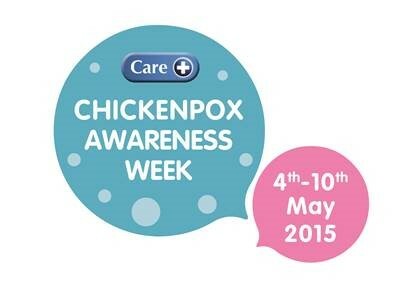 The first ever Chickenpox Awareness Week will take place from 4th – 10th May this year. Supported by Care, the number one brand sold into UK pharmacy and makers of ViraSoothe Chickenpox Relief Cooling Gel and Spray Gel. Chickenpox Awareness Week aims to raise awareness and help better inform parents about the chickenpox virus and how best to manage and treat the condition. Research shows nine out of 10 children in the UK will catch chickenpox, most of them before the age of four. Caused by the highly contagious virus, varicella-zoster, chickenpox results in a number of very unpleasant symptoms including an itchy rash, spots and blisters. The resulting scratching can lead to further infections, sleepless nights and permanent scarring. Research has found that scratching and scarring are two of the top concerns for parents when it comes to chickenpox. With over half saying they worry about their children scratching, and 38 per cent saying they are concerned about spots scarring. What is your experience? Have your children had chickenpox or are they yet to have it? We have two who have had it and two yet to have it! I am an independent filmmaker looking for people whose children have had serious complications of Chicken Pox (varicella). We want to ensure more parents understand how severe varicella can be, and the impact this could have on their child. We know that parents, especially mothers, talk to, rely upon and listen to the experiences of others like themselves. Our aim is to develop a series of short videos of parents talking about their experiences and views on varicella – how they perceived the disease, they managed it, what they think about it and what they would say to another parent. We also want to talk to, and hear from adults whose lives have been affected by the complications of varicella. The videos would be a resource for anyone searching for information or guidance on childhood diseases, especially varicella. The videos will be hosted within communication channels such as YouTube. The interview would only take about 15 minutes and then we’d spend some time filming you walking about, making a cup of tea or reading a book to get some mood shots. The interview will only be about you and your experience so we won’t film or show images of your child. The film is entirely non-promotional and we can’t mention vaccines or any specific treatments. Is this something you would wish to participate in? If so please do let me know. Me too – I have photos of me covered in the stuff! My two had it a couple of years ago, and thought they were covered in spots, weren’t too bad with it. We found Piriton and oat baths good for relieving the itching. I know – me too, nasty isn’t it! Some useful information here, as I’m sure we’ll have to deal with it sooner or later. I wonder how you make an oat bath? Incidentally, is it true you can only get chickenpox once? I’d always believed that but I recently heard otherwise.